Creating a culture of the three R’s in your office will enact a powerfully noticeable change. Motivate everyone to get on board by casting a green vision and providing incentives. Express to customers and clients that your company is taking steps in the green direction today. Prune away small, wasteful practices and rethink your large-scale impact on the environment. Here are helpful hints for getting started with the three R’s in the workplace. 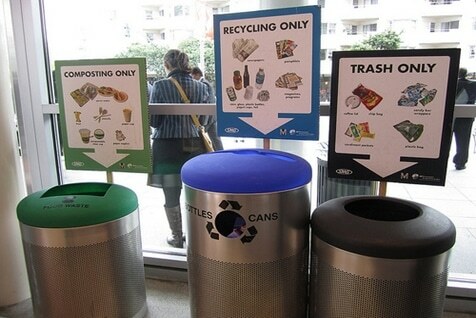 Reward departments for having low amounts of trash by redirecting waste to recycling bins. Purchase office equipment made with recycled materials such as the Evolution Executive mat. Launch a composting program to keep food scraps out of the garbage bin. Recycle toner cartridges and dispose of light bulbs and batteries responsibly. Install low-flow or more efficient commodes in your building to reduce water use. Encourage direct deposit to eliminate paper checks. Email all memos rather than printing them. Reduce heating and cooling costs by investing in premium insulation and smart windows. Reduce the pesticides used in landscaping or switch to natural pest control methods. Eliminate Styrofoam and plastic cutlery by requesting staff use mugs, plates and other items from home. Redirect rainwater to containers for use in garden areas. Harness the power of the sun by installing solar panels. Save money by purchasing gently used office furniture. Reuse office supplies such as paper clips and rubber bands. Reuse folders by slapping on a new, organic label. Our cloth towel dispensers provide a quick and economical method for people to dry their hands. The dispensers have separate chambers for the new and used portion of the towel, which ensures no contact and an unparalleled level of hygiene. During cleaning, towels are processed at over 150°C to ensure complete sterilization. Start recycling for greener environment. Talk to an Expert! Our representatives are waiting for your call.